Happy Monday, friends! I hope everyone had a great weekend and you’re not recovering too hard from St. Patrick’s Day. Things around here were a little more low key. I made matcha muffins, Lucky Charms Snack Mix (which would also be great for Easter!) and we did LEGOs and crafts with the boys. Their schedules lately have been crazy and everyone had a little gunk/sick going on last week, so I think we’re all still recovering from that a little bit. I wanted to start this week by sharing 5 things we do to start our week on a good note. I hope that this will inspire you to take some positive steps to start your week! I read an article a while back about why you should make your bed every single day, and this is something we always do in our room and for the boys (we’re trying to teach Jackson in baby steps to do this on his own). I have this philosophy that I always want my house to be picked up and put together so that if anyone were to stop by unexpectedly that our house would be presentable. And making your bed is the easiest thing you can do to start your day already feeling accomplished. Just like that, you’ve crossed one thing off of your list and whether you stay home or head to an office, you’ll come to your room with things cleaned, in order and feeling calm. This is something we’ve been doing for about 3 weeks now and it has been amazing for saving time in the morning, and also keeping us eating healthy to start our days. The best part about this is that it takes about an hour (at the most) on a Sunday to prep breakfast for the week. 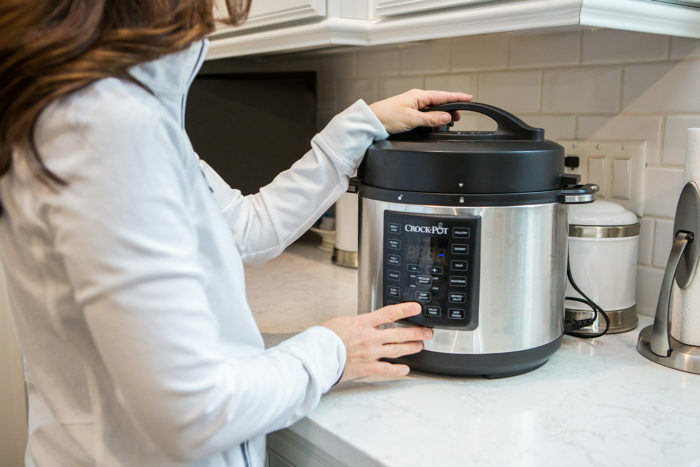 To make a week of breakfasts, we use our Instant Pot and it works perfectly! First up, we do a dozen hard boiled eggs, which takes about 15 minutes total time to do. Then we’ll do a batch of steel cut oats using this recipe from SkinnyTaste. We add a little extra cinnamon and portion those out in to containers like these, which are really the perfect portion size. To go with both, we have washed grapes and cut up fruit in the fridge. If it’s an “egg day” for me, I usually add a piece of toast or an english muffin because I feel like I need the little bit of a carb to get my day started. We also make sure we have chopped almonds, portioned bags of brown sugar/cinnamon mix and strawberries in the fridge to go with the oatmeal. It’s really nice to know that breakfast is ready to go, since our mornings are so busy anymore. It saves a ton of time! On either Sunday night or Monday morning, before I do any work for the week, I block out 30 minutes to review my calendar and plan out my schedule. I look at everything that’s already there and then Clint and I go over who has what meetings on what days and if we need to adjust our schedule at all for the boys and their activities. I also plan in my workouts for the week. I’ve signed up for a bootcamp on Monday and Friday for both March and April, so I know those days are covered but I will check the Peloton schedule for days I may want to ride live or bookmark a few rides that I want to do during the week. We also almost always put together a meal plan for the week. It’s helpful for us to know when we’ve got a sandwich or leftover night, or who is cooking when. I know we all want to “do it all” every single week, but I’ve found that it really helps to make things realistic. It’s sort of that “underpromise and overdeliver” thing that always works and makes you feel even better about all you’ve accomplished. I have this little notepad from Anthropologie and I found that writing down my daily and weekly goals is really helpful. Even if it’s little things like “Finish the boys’ laundry,” or “write 4 social posts for 1 client,” it helps keep me on task to finish things that I need to get done during a day. I’m super excited to share this Talbots x O Magazine capsule collection with you today. This collection also benefits Dress For Success, one of my very favorite charities and 30% of the proceeds go to benefit Dress for Success. This collection is inspired by Talbots’ belief that women should feel good and look good on the go. The jacket I picked from the collection is really great with workout pants or with a tee and jeans. I also plan on wearing it on vacation with this super cute romper for cooler mornings or evenings. There’s also a dress in the collection that looks a lot like the romper so if you love dresses for summer, this is a great one.